First, Lindsay Morriss just graduated with an MBA focused on the wine industry from INSEEC in Bordeaux. Her thesis was “Raising the Profile of German Wines in the US”. The German Wine Society wanted to hear from the horse’s mouth what this implies. If you want to study Lindsay’s research in more depth, please contact her via her website Lindsay du Vin. Second, as part of her studies, Lindsay interned at Weingut Georg Albrecht Schneider in Nierstein in Rheinhessen. Weingut Georg Albrecht Schneider is well known in the German wine scene in the US, as it exports about half of its production. Lindsay lead us through a tasting of Georg Albrecht Schneider wines. Before the tasting in Washington DC, on my last trip to Germany, I had visited Weingut Georg Albrecht Schneider to take some pictures for the event in Washington DC. This was not my first visit of Weingut Georg Albrecht Schneider. I had visited Weingut Georg Albrecht Schneider before, and had met owner Ulrike Schneider in Washington DC earlier. Since the US is such an important market for them, the Schneiders come regularly to the US. I have visited Weingut Georg Albrecht Schneider several times, the first time, when Lindsay was interning in Nierstein. Weingut Georg Albrecht Schneider is owned by Albrecht and Ulrike Schneider. The vineyard area totals 15 hectares. More than two thirds of the area is planted with Riesling; other grape varieties include Müller-Thurgau and Silvaner. “We own many very good vineyards and have planted them with Riesling” Albrecht Schneider said. In addition, grape juice, perlé wine, bottle-fermented sparkling wines and grappa-style spirits are also produced. Here are the wines from Weingut Georg Albrecht Schneider that we tasted. I have always been a big fan of Robert Kacher Selections wines and now I had the chance to have dinner with Robert “Bobby” Kacher - who Robert Parker called "one of the 20 most influential wine personalities in the past 20 years." The dinner was organized by Calvert and Woodley and took place at Ruth's Chris in Dupont Circle in Washington DC. Robert Kacher lead us through a highly informative tasting of specially selected wines, each paired to Ruth's Chris delectable cuisine. The dinner offered me the chance to spend an evening with 3 important wine personalities of the Washington DC wine scene: Maria E. Denton, CWE, from Ruth’s Steak House in Dupont Circle, Ed Sands from Calvert and Woodley and Robert Kacher from Kacher Wine Selection, all from Washington DC, USA. Let’s start with Maria. She was only acting in the background of this evening that belonged to Bobby Kacher. But she is an important name in the Washington DC wine scene. Maria E. Denton is the General Manager and Sommelier of Ruth’s Chris Steakhouse in Dupopnt Circle. Her certifications include Certified Sommelier with the Court of Master Sommeliers, Certified Wine Educator and Certified Specialist of Wine with the Society of Wine Educators and Spanish Wine Educator with the Wine Academy of Spain. She currently sits on the Board of the Society of Wine Educators. Maria told me that she is planning a wine dinner with Panos Kakaviatos for early 2012. I am sure this will be a highly interesting evening. Then there was Ed Sands from Calvert and Woodley, with MacArthur Beverages the top wine retailer in Washington DC. Ed Sands opened and closed the evening. Calvert Woodley opened its doors in 1982 after the merger of two competitors, Calvert Liquors and Woodley Wine & Liquor, and is still owned and operated by the original owners and their families. Dating back to 1945, Calvert Liquors was located on Wisconsin Avenue in the Glover Park neighborhood. Woodley Wine & Liquor, created in 1966, was in the Cleveland Park strip across from the Uptown Theater. When the opportunity arose for Aaron Bernstein of Calvert to join forces with Ed Sands of Woodley, the two jumped at the chance and moved to the current location in the Van Ness/UDC neighborhood at the corner of Connecticut Ave and Windom. Each store brought its strengths to help Calvert Woodley thrive. From Calvert came, among other things, La Cheeserie & International Deli and from Woodley came the direct importing of Bordeaux that has helped make the Calvert Woodley wine department the power it is today. Woodley began selling Bordeaux Futures with the 1966 vintage! With about 50 employees, including sons of owners David Bernstein and Michael Sands, Calvert Woodley is poised to excel for years to come. Then, last but not least, Robert “Bobby” Kacher. Over more than three decades in the wine business, Robert has poured his boundless energy, acuity, and extraordinary passion for wine wholeheartedly into every bottle he imports. The proof is in his portfolio. It is an unrivaled collection of distinctive wines from every nook and cranny of France (and increasingly, elsewhere), from Grand Cru wines down to the most humble vin de table. Regardless of official classification, country of origin, or price category, every bottle that Bobby imports is unmistakably a "Robert Kacher Selection" -- an impeccably made wine of vibrant fruit, exceptional character and authenticity to the appellation, and more often than not, a tremendous value. Born and raised in Florida before moving to Washington, DC in 1971, Robert Kacher received his wine education traveling the wine roads of France. Strapping on a backpack, he headed to Europe with a desire to learn about wines and winemaking by exploring France and its many varied wine-producing regions. While traveling, he fell in love with the wine, food, family and the vineyards and kitchens of France. This lifestyle captivated Bobby and it grew to become an all-consuming passion. After working as a consultant at a retail shop in Washington, DC following his return from France, Bobby soon switched to the import side of the business. Twenty-five years ago, he founded Robert Kacher Selections. His goal with the new company was to associate himself with the growers and producers who had both the pass ion and energy to become the top winemakers of their respective regions. 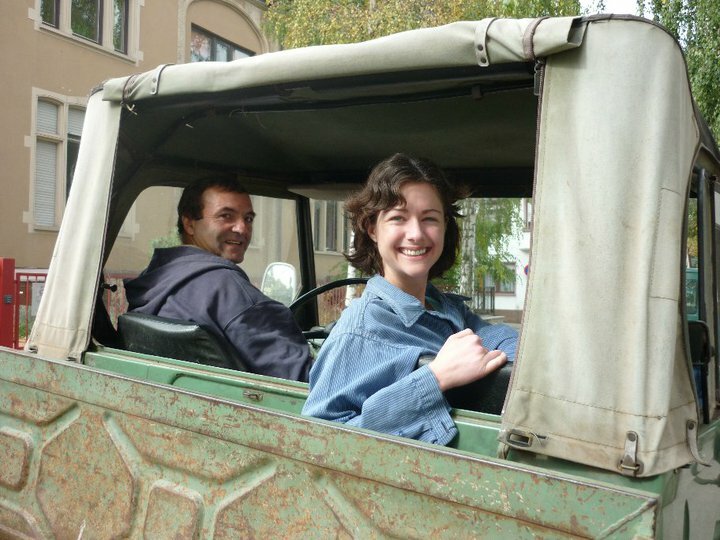 Bobby spent almost half of each year in France, criss-crossing from region to region in an effort to select and help develop the finest portfolio of French estate wines offered in the US. Through this hands-on approach of working side by side with growers and producers, Bobby was able to ensure the quality and authenticity of every wine in his collection. Bobby's philosophy is to work as a partner with the growers and winemakers in all aspects of viticulture and vinification, constantly pushing them to produce even higher quality wines. Some of the innovations he introduced to his growers and wine makers include lowering yields, using state-of-the-art trellising, green harvesting of fruit at 'veraison' (the point at which grapes start to change color), and hand harvesting and hand selecting of fruit. 2010 Domaine de Pouy - Cotes de Gascogne: We started with the super-fresh, citrusy 2010 Domaine de Pouy ($6.99), made in Gascony from the Ugni Blanc grape. Although relatively inexpensive, it's a signature Bobby Kacher wine in every way. 2009 Domaine Thomas et Fils - Sancerre "La Crele": The racy complexity of Sauvignon Blanc grown in Sancerre's chalky soil played out brilliantly against the backdrop of the ripe-style 2009 vintage in the impeccable 2009 Thomas "La Crele" Sancerre ($19.99). 2010 Alain Assadet - Menetou-Salon Blanc: Although there are subtle differences between the terroir of Menetou-Salon, an up-and-coming region in central Loire, and that of Sancerre and Pouilly-Fumé to its east, the biggest difference here maybe the vintage. In sharp contrast to the almost tropical 2009 vintage, 2010 is a classic, cool season Loire year. The well-made 2010 Assadet Menetou-Salon Sauvignon Blanc ($16.99) rings with the freshness and vibrant acidity of the vintage. 2009 Domaine Marc Morey - Rully Blanc 1er Cru "Rabource"
From the Loire, we moved to the great vineyards of Burgundy. The captivating 2009 Cordier Pouilly-Fuissé ($25.99), from one very finest producers of the appellation, displayed a creamy mélange of peachy, white flower Chardonnay fruit, nuanced by gentle lees stirring and a touch of oak. Its alter ego must surely be the 2009 Marc Morey 1er Cru "Rabource" Rully ($29.99), a thoroughly modern take on white Burgundy. Its powerful 1er Cru terroir has no problem handling the wine's generous dollop of new oak, made in a style reminiscent of a Meursault. 2009 Xavier Monnot - Maranges 1er Cru "Clos de la Fussière": Xavier Monnot is a 17-hectare estate, all family-owned, located in Meursault. About 50% of the vineyards are planted in white, 50% in red. The production though is 65% white. Domaine Xavier Monnot’s vineyards are very spread out, covering most of the Côte de Beaune starting in Beaune 1er Cru “Cent Vignes” and stretching all the way to Maranges 1er Cru. 2009 Joblot - Givry 1er Cru "Clos de la Servoisine": The outstanding estate of Joblot is run by Jean-Marc and Vincent Joblot is the town of Givry, located in the Côte Chalonnaise. This is the region located directly south of the Côte d’Or. Few would argue Domaine Joblot is producing the finest wines in the appellation. The nucleus of the commune consists of an elongated amphitheater-like band about three miles in length and superbly sheltered from the westerly wind. This section is blessed with a very rocky, limestone rich soil. Situated just above the village, is where the premier cru vineyard of Clos de la Servoisine can be found. The wine made here is richly textured with profound color, fruit and length. It is surely as good and long lived as many wines at double the price from more pedigreed locations in the Côte d’Or. Our Givry 1er Cru is fermented and aged in barrel for up to 16 months. Kobrand’s Tour d’Italia 2011 came to Washington DC and I took part in it. Kobrand is a privately owned marketer of wines and spirits in the USA that serves as the exclusive agent for many fine European wines. In addition, the firm owns many of the brands in its portfolio, notably Maison Louis Jadot. Kobrand's wine offerings include wines from California, France, Hungary, Italy, New Zealand, Portugal, and Spain. In particular, I find the Italian portfolio very strong. I was delighted when Gary Gondelman from Kobrand invited me for the Kobrand Tour d’Italia 2011 at the Occidental in Washington DC. In wines, the firm focused on French brands until 1978, when it began to market the Italian wines of Michele Chiarlo in the United States, which I could also taste at Kobrand’s Tour d’Italia 2011 in Washington DC. It was quite an impressive group of winemakers that poured their wines at the Kobrand Tour d’Italy 2011. The group toured the US from September 12 to September 23, with 10 stops, including in Boston, New York, Houston, Chicago, Miami Beach and San Francisco. I understand, they also hosted winemaker dinners. From talking to them at the tasting in Washington DC, I gather that these winemaker dinners must have been great fun. Who participated in the Kobrand Tour d’Italy 2011? The wine producing firm of Michele Chiarlo was founded in 1956 by the present owners, Michele and Giuseppina Chiarlo. Michele Chiarlo is today one of the most respected producers of the fine wines of Piedmont. Perhaps the crown jewel among the vineyards of Michele Chiarlo is the vineyard of Fornace di Tassarolo in the Rovereto area of Gavi, a small parcel planted in 1910 which yields a brilliant and intense Gavi of exquisite refinement. Michele Chiarlo also has long-term agreements with the owners of two spectacular vineyards in the Castiglione Falleto and Serralunga crus of Barolo, from which he produces Barolo Riserva Rocche di Castiglione and Barolo Riserva Vigna Rionda di Serralunga. In addition to these contracts, Michele Chiarlo also purchased the Antico Podere Averame in the Cerequio cru of Barolo, considered one of the zone's finest Nebbiolo vineyards; and an estate, also in Barolo in the cru of Cannubi, which due to its extremely sharp gradient had never been cultivated. In 1995, Michele Chiarlo acquired the estate of Azienda Agricola Aluffi in Castelnuovo Calcea, considered to the most beautiful and prestigious property in the heart of the classic Barbera d'Asti zone. Since the early 1990s, Michele Chiarlo's sons, Alberto and Stefano, have entered the firm in positions which will lead to their eventually assuming full responsibility. Alberto, the elder, who I met, directs marketing and sales; Stefano, an enologist by profession, manages vineyard operations and collaborates in production in the cellars. The Folonaris are among Italy’s oldest and most prestigious Tuscan wine families with a winemaking history dating back to the late 1700s. Today, Ambrogio e Giovanni Folonari Tenute, conceived by this father-son team as a collection of small, beautifully located vineyards producing primarily Tuscan “grand crus,” is recognized for its distinctive, small-production wines from the family’s numerous estates. Both Ambrogio and Giovanni, a University of California at Davis enology graduate, are directly involved in winemaking. • Ronco dei Folo Estate (Colli Orientali del Friuli, Pinot Grigio, Tocai, Sauvignon). Giovanni and his wife Eleonora live with their three children at the Cabreo Estate in Greve, 30 minutes from Florence. Tenute Silvio Nardi consists of 80 hectares of vineyards in an unspoiled part of central Tuscany: Montalcino, whose symbol is its great red wine, Brunello. Silvio Nardi founded the estate here at Casale del Bosco; since 1985 it has been run by his youngest daughter, Emilia, who I met. Emilia Nardi knows she can depend on Casale's special and distinctive territory to produce a contemporary and elegant Brunello. She has invested single-mindedly in the vineyards in this harmonious natural setting - as any tasting of her fine wines will attest. Each of her signature wines expresses the differing character of Sangiovese when it is grown at Montalcino. The estate's vineyards are situated between 140 and 420 meters above sea level: some extend north-west of Montalcino on the hills around Casale del Bosco, while others are located to the north of it at Tenuta di Bibbiano and to the south-east at Manachiara, where the precious cru of the same name originates. The undisputed rising star among Italy's fine wine producing regions since the early 1970s has been the northeast, notably the province of Friuli-Venezia-Giulia. Among its viticultural houses, none has captured greater achievement nor well-earned respect than Azienda Fratelli Pighin, one of the region's most esteemed producers of pure varietal, D.O.C. Grave del Friuli wines. Azienda Fratelli Pighin was founded in 1963 when brothers Ercole, Luigi and Fernando Pighin acquired a 500-acre estate in the D.O.C. Grave-del-Friuli zone then belonging to an aristocratic Friulian family. In 1968, a further 75 acres of vineyards were acquired at Spessa di Capriva, in the province of Gorizia, in the tiny, prestigious D.O.C. Collio zone, expanding the company's portfolio to encompass a full range of fine, classic wines from the two finest viticultural growing areas in Friuli. These areas are by general consent recognized to be among the finest viticultural areas for white wines in Italy. Beyond the domestic market, the wines of Azienda Fratelli Pighin are represented in ten export markets, of which the most important are Germany and the United States, through a commercialization strategy focusing on restaurants, small wine shops and gourmet boutiques. In fact, when Roberto realized that I spoke German, he switched to German. Piero Incisa is a third-generation winemaker, the grandson of Mario Incisa Della Rochetta, the creator and proprietor of Sassicaia, one of the most renowned Italian wineries, and nephew of Niccolo’Incisa Della Rocchetta, who currently manages the family’s wine-making enterprises. Piero spent his childhood on the family estate in Tuscany, privy to the exclusive centuries-old wine-making and vineyard management traditions to which he now claims his own expertise. Now a resident of the United States, Piero divides his time between New York City, Italy and Patagonia, where he has begun a very limited production of his own Pinot Noir. Sassicaia - the now historic wine single-handedly responsible for launching the Super Tuscan movement - remains one of the most sought-after wines in the world. Marchese Niccolò Incisa della Rocchetta continues the 36 year old tradition at the Tenuta San Guido estate, which is considered by many to be the birthplace of Tuscan Cabernet. The estate of Sette Ponti lies in the heart of the Chianti zone, fifteen miles northwest of the city of Arezzo just past the village of San Giustino Valdarno. The Via del Monte, known locally as the Via dei Sette Ponti, leads into a beautiful hidden valley and to the estate. The name Sette Ponti, or "seven bridges," refers to the seven bridges crossing the Arno River on the road from Arezzo to Florence. The first, the Ponte Buriano, is nearby. Erected in the mid 13th century, it took nearly forty years to build, and is perceptible in the right far background of Leonardo DaVinci's Mona Lisa. Previously the property of the Princesses Margherita and Cristina Savoia d'Aosta, the core of the Sette Ponti estate was purchased in 1957 as a hunting retreat by architect Alberto Moretti, and is now the family property of Antonio Moretti, his son. After graduating from Siena University with a degree in economics and banking, Antonio Moretti opened his first apparel store, a business which has since expanded to a chain of shops throughout Italy, and the acquisitions of Arfango, known for its fine leather goods, and Bonora and Carshoe, two brands of handmade shoes. The vineyards occupy a total of 150 acres and lie at an altitude of 200 to 300 metres (600 to 900 feet). The oldest vines on the estate were planted in 1935 by HRH the Count of Turin, Vittorio Emmanuele di Savoia. This five-acre plot, called the Vigna dell' Impero (the "Vineyard of the Empire"), is a hand-terraced vineyard planted primarily to Sangiovese vines interspersed with traditional Canaiolo, Colorino, Trebbiano and Malvasia. An adjacent 87-acre section of this vineyard, also of principally Sangiovese vines, was planted in the early1960s by Alberto Moretti. I knew Paul Gregutt from the Internet. I follow his Blog and in particular enjoy reading his column titled "Wine Adviser" in The Seattle Times. At the 1. Oregon Pinot Gris Symposium, I met Paul in person. Unfortunately, I did not have much time to talk with him. He is just too popular in this part of the world and the winemakers present were so eager to talk with him. But I was able to have a short conversation with him. Paul’s book, Washington Wines & Wineries: the Essential Guide, is now in its fourth printing and is the authoritative guide to Washington State wine. About half a century ago, there was basically no wine industry in Washington State. And if wine was made, it was not with the noble European vinifera grapes. But the American wine boom that had its origin in California moved to the north, first to Oregon and then it also reached Washington State. In 1980, four years after Californian wines had out shined the French wines at the famous tasting in Paris, there were about 20 wineries in Washington State that were producing high-quality wines with European vinifera grapes. Today, there are more that 500 wineries. In the beginning, white wines dominated. As recently as 10 years ago, 70 percent of the grapes planted were white grapes, with Chardonnay the No. 1 grape. But encouraged by the success of Oregon with its Pinot Noirs, the balance between white and red wine has shifted towards red; red wines now account for almost half of the wine production. In general, if California’s wines are rich and powerful, Washington State’s wines are more crisp and delicate, reflecting its location much more up in the North. They remind me a lot of the wines I know from Germany. Although a relatively young wine industry, Washington State is now the nation's second largest wine producer and is ranked among the world's top wine regions. After attending the 1. Oregon Pinot Gris Symposium, I spent a couple of days in Washington State. I had a memorable luncheon with Oyster Guru Jon Rowley in Seattle and visited Hightower Cellars, Pacific Rim Winemakers and Long Shadows Vintners, all close or in Walla Walla. Paul also contributes to publications such as Vineyard & Winery Management, Yakima Herald-Republic, the Walla Walla Union-Bulletin and the Spokane Spokesman-Review. Paul is the Northwest Editor for Wine Enthusiast Magazine, and has written the Pacific Northwest material of Tom Stevenson's annual Wine Report, as well as contributions to Decanter and Wine Spectator. Finally, Paul is also a musician. In the evening after the 1. Oregon Pinot Gris Symposium, I had arranged to listen to Jay Somers, the owner and winemaker of J. Christopher Wines, who played that night with his group at the White Eagle in Portland. But unfortunately, Paul could not make it. Paul’s genre is acoustic/alternative/country. Paul lives outside of Walla Walla in the South East of Washington State.